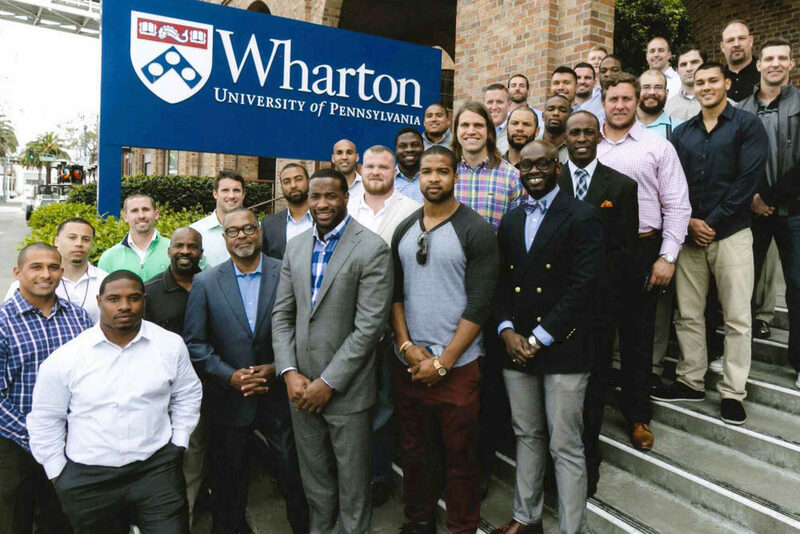 The Wharton Sports Business Initiative uniquely provides industry insiders an opportunity to partner with a prestigious business school to focus on sports industry thought leadership. Wharton provides the sports industry with cutting-edge insights and research in the areas of management, finance, real estate, entrepreneurship, economics, marketing, law and leadership. 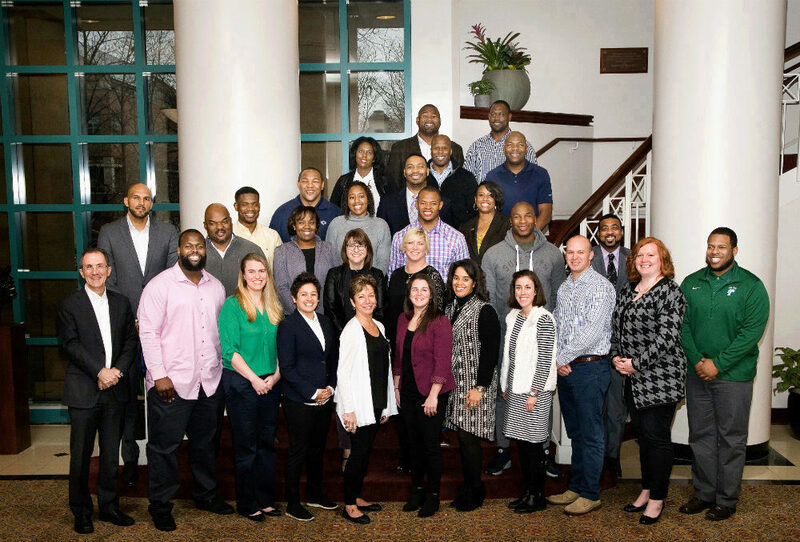 The Wharton Sports Business Initiative provides access to world class faculty that lead discussions on industry trends and social issues and that also sit on or moderate panels at nationwide and worldwide sports industry conferences. The academic setting allows industry competitors to benchmark and collaborate on industry wide issues. WSBI works with Wharton Executive Education to offer educational programs. WSBI hosts sports conferences, forums and prominent sports industry speakers. WSBI develops publications to communicate current developments, upcoming events, and sports business related research. Companies provide consulting opportunities for Wharton students through Field Application Projects or Independent Study Projects. At Wharton, Executive Education programs are customized for executives to learn best practices in business on campus. The school’s top tier faculty design and teach the programs combining theory and practice so participants walk away ready to use what they’ve learned. When C-suite executives look for academic sports business insights, they reach out to Wharton Sports Business Initiative faculty. WSBI conducts numerous consulting projects for top organizations in sports business annually. Typical projects consist of examining specific elements of a company’s current business, conducting viability studies of prospective new lines of business or otherwise offering recommendations on particular business issues after market analysis. Completed a project for a major professional sports league that focused on enhancing the value associated with being a season ticketholder to a team in the league. Completed a project for a major sports league to develop a comprehensive long‐term strategy for international talent acquisition in the league in both the amateur and professional marketplaces in Japan, South Korea, Taiwan, Cuba and Mexico. Completed a project for a major sports league that focused on the development of a comprehensive strategy to reinvigorate youth participation in the sport, which became one of the focal areas of the league. Completed a project for a professional sports league that involved the league’s international growth strategy. With only 1% of the league’s revenues derived from international sources, the project provided strategic recommendations for increasing the market penetration of its international live game video product and enhancing fan affinity. Completed a project for a major professional sports league that identified five new business ideas, with each concept having the potential for at least $10 million in revenue, and ultimately prepared fully developed business plans for two selected concepts involving an emerging technology and a brick and mortar consumer product, including a review of the relevant industry landscapes, strategic assessments and recommendations for the league. Completed a project on behalf of a professional sports league that created an Affinity Rewards program for that league’s fans, including an assessment of the needs and desires of various stakeholders, recommendations on the structure of the program, and built a financial model analyzing the expected return on investment. Prepared the management of a professional sports league for its upcoming collective bargaining negotiations with the players’ union. Analyzed the league’s free agency process and trends in team management of free agents by taking two approaches: looking club by club for teams following certain paradigms and reviewing it from a competitive balance standpoint. Investigated the league’s roster composition and player allocation and how this differed from the other sports leagues. This involved a comparison of the leagues’ collective bargaining agreements in order to see what affects competitive balance, weighing the advantages and disadvantages of different rules or trends, and determining strategies that other leagues use that were worth incorporating into the league’s collective bargaining agreement. The league incorporated a number of the recommendations made by the project team into their initial proposal to the union, and several of them were included in the final agreement between the parties. Completed a consulting project for a major professional sports league that developed the various business models that could potentially be involved in the broadcasting of league games in 3D as well as enhancing the out-of-home viewing experience for the league’s fans. Created the entire business plan for a new, self-sustaining professional sports league in Europe to be owned by a major North American sports league. The project involved the entire gamut of issues involved in the creation of a new league, including the operating structure of the league, the number and location of the franchises, scheduling, the impact on the existing European leagues in the sport, the risk and return models, financial projections, and the five year path to the implementation of the new league. Completed a consulting project for the official minor league of a major professional sports league. The project involved providing a strategic analysis of marketing partners that invest resources in digital sponsorship and marketing opportunities on minor league sports websites. In an effort to attract these businesses to the league, the team provided detailed insights into the relevant social networks, strategies, competitive landscape and business models in this space. We ultimately made recommendations to the league to develop a strategy to effectively utilize, monetize and grow its digital assets. Completed a project with an NFL team to help create a recommendation for a new business venture that would help enhance fan experience and establish the team as an innovative industry leader through the use of emerging technology. The new venture would allow for the team to create new revenue streams. Completed a project with an MLS team as the franchise was looking to redirect demographic targeting toward three major currently-underrepresented groups among its growing fan base: females, Hispanics and college students. There was an additional focus on a social media strategy and how that could help attract each of the above demographics to the team. Completed a project for an NFL team that focused on the creation of a new strategy for engaging fans on game days via digital media. With a focus on transparency, mass personalization, interactivity, access and providing ‘new’ experiences, the recommendations included initiatives around Instagram, location–based games and challenges, building rivalry narratives, and building and connecting interactive fan communities. Completed a project for an NFL team that investigated the business opportunities for team-branded or affiliated fitness centers, with an industry overview, an analysis of the local market, the development of a marketing and sales strategy, and the creation of a business model and financial analysis. Completed project for an NFL team that focused on the creation of extensive business plans for various potential brand extensions, involving three separate concepts: the use of the team’s practice facility as a public sports facility when not being utilized by the team, the formation of partnerships with existing local sports facilities, and the entry of the team into the children’s market via a team-branded retail space and interactive play facility. Completed a project for an MLS team that involved working directly with both the team’s CEO and President to identify the inclinations, preferences, and desires of both general sports fans and soccer enthusiasts that assisted the team in motivating ticket purchases and game attendance prior to the franchise beginning play in MLS. To do so, the project team devised a survey and administered it via a market research company to approximately 500 sports fans in the team’s designated market area matching the area’s demographics. The survey measured both casual and avid soccer fans’ inclinations and desires relating to the team and stadium, providing insights into pricing of tickets, food and merchandise, preferred modes of transportation, perceptions of the area surrounding the stadium, optimal game times and dates, pre-game, in-game and post-game atmosphere, motivations for attending games, as well as a wealth of other information. The team used all of the information gathered and implemented the majority of the project team’s recommendations. Completed a project for an NBA team gauging the impact of the franchise’s potential relocation on the team’s brand, both during and following completion of the construction of the team’s new facility. Specifically, the project team designed survey instruments and developed a plan for their implementation. The project entailed: researching whether the team’s likely new name is the right name for the move; researching the team’s brand more broadly; and developing and conducting season ticket holder focus groups. The team chose to follow the recommendations of the Wharton project team and adopt the suggested name upon its move. Completed a project for a professional sports team that identified the location and sports consumption habits of the numerous ethnic populations in its home DMA, and determined the strategies that allowed the team to best reach these populations and build its fan base. Completed a project for a major sports property to increase its brand visibility and relevancy in a major US city. The all-encompassing plan focused on an experiential destination for the property including analysis and recommendations for real estate economics, financial modeling, as well broadcasting and technology showcases, and B-B and B-C hospitality. Completed a project for a sports focused non-profit by creating a growth model to help expand the impact that this organization can have across the country in order to maximize the voice, sustainability and efficiency of the non-profit organization. Completed a consulting project for the owner and operator of an MLS team. The first aspect of the project involved analyzing the ticketing information from the team’s ticketing platform and creating a ticket reporting dashboard for the team’s ownership. The second aspect of the project involved devising three marketing campaigns – one driving adoption of the ticketing platform among season ticket and individual game attendees, and two others targeted at increasing ticket sales to Hispanics and young professionals. Completed project with a major sports property that involved two activities not typically thought of as sports in the traditional sense: Cheerleading and Dance. The focus was on leveraging the property’s considerable event capabilities to penetrate the highly lucrative competitive cheerleading and dance marketplaces. Business plans were created for each. Completed a project on behalf of a high profile national governing body that focused on the creation of business plans for various potential brand extensions. Licensing opportunities for a line of NGB-branded consumer health products, resorts and experiential opportunities and sports drinks were explored in depth, as were several potential China-based opportunities and the potential for joint licensing opportunities across major events in the sport. Completed a consulting project for a leading sports tour, providing it with both a framework and a fully developed plan for its upcoming season, with suggested locations, venues, and regional analysis; marketing and branding strategies for both; revenue generation and sponsorship models; and a financial analysis. Completed a project on behalf of the operator of a state governmental body that regulates thoroughbred horse racing, pari-mutuel wagers and tracks. Developed a business plan to consolidate a statewide advance deposit wagering system, which permits customers to bet from their homes via the phone or internet. This involved assessing technology, marketing and deployment strategies and developing a revenue distribution model to maximize revenues to all constituents. Completed a project for a national sports governing body, working with the organization’s senior executives to create a business plan for an online sporting goods store and other offerings to complement its recently launched membership program for youth coaches, administrators and officials in an effort to make the sport more affordable, provide value to its members and create a profitable line extension with limited financial risk. The organization adopted the Wharton team’s recommendations in full. Completed a project for a leading youth soccer club based in a major urban area. The project aimed to research and deploy a strategy to leverage its unparalleled success in urban youth development in a way that yielded long-term funding, as well as maximized its media exposure and branding potential by identifying core brand characteristics and messages that were the subject of a subsequent public relations campaign. Completed a project for a major internet provider, working with the company’s senior executives to develop business plans for new, enhanced or revamped offerings within its sports site. The end goal of the project was to increase unique visitors by reaching those sports fans who currently spend time on other sites and are less familiar with the company’s new offerings by developing a targeted grassroots campaign around its re-branding, as the company had limited resources to support this effort. The undertaking of a comprehensive review of both the company’s and the industry standards for sports blogging, fantasy sports, original content and third party content helped to allow the entity to best monetize its offerings. Completed a project for start-up consumer products company that had a strategic partnership with the U.S. Olympic Committee. The purpose of the project was to assist the company with its expansion plans and the role of sports properties such as the USOC within those plans. If your organization is interested in partnering with WSBI on a project please contact us.